Čitaj Mi - Croatian campaign "Read to Me!" Croatian campaign "Read to Me!" "Read to me!" is the first Croatian national campaign promoting reading aloud to children from the earliest age. It is organized by the Croatian Reading Association, Croatian Library Association - Children and Youth Services Commission, Croatian Paediatric Society, Croatian Association of Researchers in Children's Literature with support of UNICEF. Campaign was launched on the occasion of the European Year of Reading Aloud (2013.) and it is sponsored by the Ministry of Social Policy and Youth. The campaign was launched with the aim to continuously promote early literacy and reading in families over the next few years and to make reading aloud a part of daily routine in Croatian families with small children. Also, campaign’s aims are to make library services for babies and small children a part of regular services in public libraries and to intensify cooperation between librarians, pediatricians, speech therapists and other field experts in early reading aloud promotion. Year 2014. the campaign was joined by the Croatian Logopedic Association, who organise workshops for parents, educators and the wider public on early literacy, language, reading and writing. The early childhood (0-6 years of age) is an extremely important period in human development, and the interaction between the parent and the child has a key role in it. The research entitled "How parents and communities take care of youngest children in Croatia" carried out by UNICEF in 2012. In this survey 1.700 parents of preschool children participted. The first such comprehensive study was led by Dr. Ninoslava Pećnik of the Department of Social Work from the Faculty of Law in Zagreb. The research offers an insight into the prevalence of certain developmentally desirable and undesirable parental behaviours and beliefs, which have been the subjects of measures and activities concerning parenting support so far. The research shows that 23% of parents of six-month-old children in Croatia do not read or look at picture-books with their babies, and that reading together does not count among the daily habits of 9 % of the parents of one-year-old children, 7 % of the parents of three-year-old children and 14 % of the parents of six-year-old children. The research also shows that 4 % of one-year-old children, 2 % of three-year-old children and 1 % of six-year-old children do not own a single picture-book. Less individual stimulating and supporting parental behaviour was experienced by children whose parents are poorly educated or of a lower socioeconomic status, children living in families with multiple children, rural areas and/or certain regions (Slavonia, Dalmatia). Although drawing conclusions from this requires caution, since the research included a limited range of parental stimulating behaviours, these results reveal inequalities in the chances of poorer children and children from rural areas to exercise their rights to the family conditions that support the full development of their potential. The knowledge of parental stimulation of the child’s cognitive and socioeconomic development in the first years of life through the manner they spend time with their children, support their curiosity and learning, and encourage development of emotional security, should be made available to all parents, especially to poorly educated parents, parents of a low socioeconomic status and parents living in rural areas. Although most parents would go to their spouse or members of the extended family for help with parenting issues, a half of the surveyed parents would consider experts like paediatricians and kindergarten teachers as the best sources of counselling support in matters of parenthood and child development. Experts of all profiles express a need for contemporary knowledge of positive parenting, communication skills and building a partnership with parents. In the context of the necessity of a further development of their own professional competences of paediatricians in support to parenting, a need was expressed for a better availability of non-medical experts in the area of counselling on matters of parenting. Experts like pediatricians, librarians and kindergarten teachers are most involved in the implementation of activities in the campaign "Read to me!". Campaign "Read to me!" aims to encourage parents and other adults to start reading to children as soon as they are born. In that way reading can become a part of their daily routine, but it also helps create special emotional bonds between them. The aim of the campaign is to include all parents and children, and to make reading a regular habit of parents and children, for which as little time as 15 minutes a day is enough. Also, campaign aims to encourage parents with young children to come to their local library as soon as possible. There they will get information on early reading aloud benefits, how and when to start reading to children, lists of quality picture books and how to choose age-appropriate books. Launch of the first national campaign for early reading aloud to children, which includes parents, pediatricians, librarians, kindergarten teachers and public media. Strengthen cooperation between librarians and paediatricians who would point out the positive aspects of the early reading to children. Encouraging parents, kindergarten teachers and other professionals working with children to support early reading in children. Encouraging parents to visit public libraries with children as early as possible and to use high-quality picture books and other sources in order to develop a preference for reading. Promoting the culture of reading and encourage reading habits in children and adults, regardless of age. Early literacy has recently become an important topic in Croatia, and there's a widespread belief that literacy starts developing almost as soon as the child is born, if the child is sorrunded with adequate materials and persons who will motivate the development of literacy. The first structured reading materials that a child interacts with are picture-books. It is usually the first contact a child has with literature and a written word in general, and it happens during childhood, the child's most sensitive period, which is why it is important to pay special attention to the quality of picture-books. One of the campaign aim is to give Croatian parents and other adults experts an overview of picture-book situation on Croatian market, trying to raise awareness of the importance of their quality and potential. The campaign sends out the message that picture books should take precedence when choosing toys from the earliest age, and that parents can change the lives of their children by their own example by fostering reading habits that have an impact on their overall development. In addition to the family, children's libraries and preschools and pediatricians are viewed as key factors affecting the development of early and family literacy. One of the campaign aim is to encourage cooperation between libraries and kindergartens and to raise awareness in this institutions of their important role in creating a culture of reading. Posters and brochures that describe the importance of early reading to children in pediatric clinics, maternity hospitals, libraries, focusing on the manner and time of reading to children and the appearance and meaning of a picture book for each age. Read to me billboards with messages for parents about the importance of reading to children from the early age. Reading and telling stories in public places: parks, squares, libraries, schools. Informative-educational packages for newborns and their parents containing informations on the need for reading to children at an early age, a short list of quality picture books for children aged 0 to 3, and a picture book that babies could read themselves. Picture book "Look at these sweet faces" donations in several counties during regular medical examinations in hospitals and pediatric clinics that were preceded by joint reading of parents, children and pediatricians. The information about the whole campaign and package information on the website www.citajmi.info - list of partners, speaking development calendar of children up to 3 years and their relationship to books, the significance of reading aloud, the availability of brochures and posters, lists of recommended picture books, photo contest for parents' photos of reading to children. Creating and maintaining campaign pages on social networks Facebook and Twitter. In the course of the campaign, parents can find posters and leaflets with information on early reading aloud benefits in every library, health center and maternity wards in Croatia. Many public libraries organized more than 1000 creative events during the campaign, such as lectures for parents on early reading aloud and early literacy, exhibitions of quality picture books, radio broadcasts of bedtime stories on local radio stations and storytelling workshops in libraries (Fairytale times, Family storytelling workshops, Reading in foreign language etc.). Millennium photo was taken in Dubrovnik by Šime Strikoman, mayors in different towns read in libraries and at squares. Reading Fairies gave free picture books to children and some hospitals opened picture book corners on children’s wards. Several public campaign presentations were held on town squares, in town halls and at expert conferences of educators and speech therapists. Libraries in small towns Koprivnica and Ogulin cooperate with local maternity wards and donate about 600 informative and educational packets to all newborns and their parents. Packets include leaflets with information about the need for reading to children from an early age, library membership card and a picture book that even babies can read. In Koprivnica 33 % more children joined a library in 2013 compared to 2012, while the number of visits of parents with children doubled. Libraries in towns Zadar, Rijeka, Karlovac, Split and Vinkovci have recorded a similar trend. Creative librarians throughout the country are preparing numerous new surprises for their members: bed-time story readings, picture book exhibitions and round table discussions, openings of small libraries in paediatric practices, and promoting regional literature by reading in the local dialect. Small "libraries" were opened in a hospitals and preschool institutions in Rijeka, Velika Gorica, Koprivnica, Zadar and Bjelovar. The books were donated by publishers, libraries, parents and high school pupils. Croatian Reading Association organized a symposium on the occasion of International Literacy Day (September 8th). Symposium gathered experts on reading and early reading to children to emphasize the importance of reading aloud. UNICEF aims to make books available to all children, especially those living in difficult conditions, through cooperation with pediatricians and librarians. To reach the most disadvantaged families living in the poorest and most remote areas of Croatia, they organized picture book donations called "Look at these sweet faces" during regular medical examinations in pediatric clinics that were preceded by joint reading of parents, children and pediatricians. In cooperation with renowned UNICEF photographer Giacomo Pirozzi a family who reads to children was photographed and those photos were later used for billboards around Croatia. In that way even more parents and adults can get information on early reading aloud benefits. 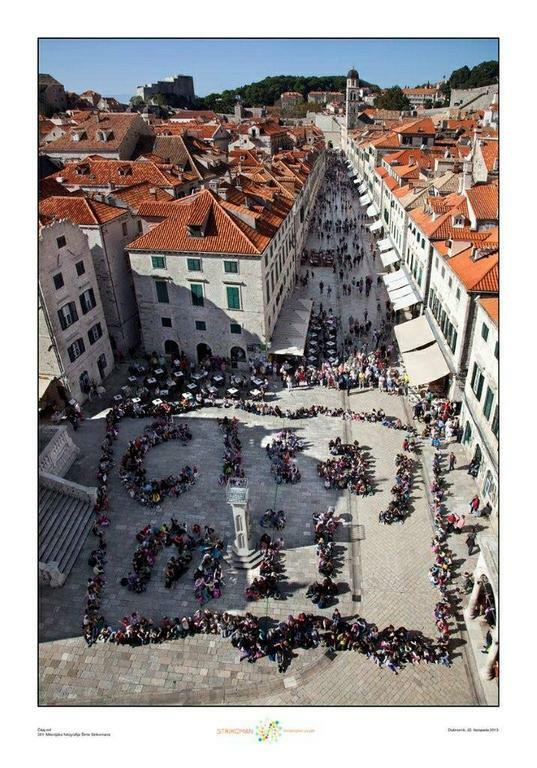 Croatian Association of Researchers in Children's Literature organized a national manifestation "Hlapić 2013." on the occasion of 100th anniversary of the first publication of "The wondrous adventures of Hlapić the apprentice" written by Ivana Brlić Mažuranić. The campaign has been advertised on a thousand poster sites throughout Croatia. It has been supported by many publishers, as well as the media, which have broadcast around 200 campaign spots. Many publishers actively joined the campaign by offering lower prices for picture books. Publisher "Algoritam" became "Proud friend of the campaign" and by November 30th 2013 their employees offered all clients a possibility to donate for the campaign. Money was used to buy picture books for children living in poor families or poorest areas of Croatia. Publisher "Mozaik knjiga" prepared a surprise for parents and children by publishing "Read to me! Metre" which shows when and which picture books parents should read as their child grows up. Other publishers such as Naklada Bombon, Školska knjiga, Profil, Ibis grafika, Planet Zoe, Naša djeca, Mozaik knjiga, Algoritam, Naklada Nika, Libricon donated picture books for the campaign’s photo contest. Parents and other family members have sent more than 200 photos and videos picturing a grown up and a child/children during their joint reading or children (up to 4 years) "reading" on their own. Campaign "Read to me!" has launched a webpage (www.citajmi.info) for parents and other adults aware of or interested in early reading benefits. It has information on why it is important to read aloud to children, materials (posters, leaflets, logo) that can be used for further early reading aloud promotion, information on the photo contest, a list of quality age-appropriate picture books and many other valuable information. Information experts share their knowledge on campaign’s Facebook and Twitter pages with interested parents, librarians, libraries, family centers, children’s and adult authors, publishers and many more. The reach and success of the first year of the "Read to Me" campaign implementation is best seen in the positive experiences of its participants, as well as the impressive figures: almost 4,000 picture books were collected for poorer families, children’s wards in hospitals, kindergartens and children’s homes; there was an increase in the number of children joining libraries, and more than a hundred libraries and a thousand volunteers participated in more than 1000 events that gathered ten thousand children and parents for book reading sessions – with numerous artists, mayors and government ministers among them. This campaign really taking root in all parts of Croatia. In places where there are no libraries, books were delivered to children on wheels in bookmobile, and soon they will become a part of the "inventory" in paediatric practices because every child has a right to have access to books and picture books. The first anniversary of "Read to Me!" was celebrated on the International Children's Book Day, April 2, 2014., in the "Cvrčak" kindergarten with a play in which the campaign organisers, actors and children presented in a fun way the excellent results of the campaign that has united the whole country with the aim of making reading a daily habit of all parents and children. They were joined by the Deputy Prime Minister and Minister of Social Policy and Youth Milanka Opačić, under whose auspices the campaign is being implemented, who read the local version picture book "Goldilocks and the Three Bears" to the children. Establish cooperation between several associations that bring together professionals working with children to support early reading aloud to children. If it is possible, librarians, pediatricians, kindergarten teachers, UNICEF, media and government jointly launch the campaign aimed at promoting reading aloud to children from the earliest age. "Reading aloud for 15 minutes helps child's overall development"
"All children have the right to access to picture books and every child should be able to develop with reading!" If you want to launch the campaign "Read to me!" please fill in the Statement confirming that you will be promoting reading aloud to children from the earliest age and work for the benefit of all children in your country.